A new article on FT.com bears the title: Bloomberg Law’s discounts pose threat. That’s some language from a press release if I’ve ever heard it. Unfortunately, at this point, I don’t think that Bloomberg Law poses any kind of threat. In the article former Lexis executive Lou Andreozzi states that he expects “many law firms and corporate lawyers to prefer its flat monthly fee of $450 per attorney to the more expensive and unpredictable sums they pay depending on how often they use rival systems.” I can’t believe that any firm would pay $450 per attorney per month to use Bloomberg Law. With no proprietary secondary sources and a brand-new homegrown new citation service, this cost seems extremely high. In fact, it sounds a lot like lower cost options Fastcase or Casemaker or even free service Google Scholar. Although he says that there will be some discounting available, it won’t be much different from their regular pricing. Discounting? That sounds a lot like Lexis and Westlaw pricing: retail with some kind of discount. He next states that Lexis and Westlaw are “duplicative services” and he expects Bloomberg Law to replace only one of them at a firm. But why would you need to replace a service that is duplicative? Why would you not just go with either Lexis or Westlaw? What reason would I have to add Bloomberg Law, especially at $450 per attorney? While I applaud the flat-rate pricing of Bloomberg Law their initial price is so high it isn’t realistic for most firms. If the price is negotiable or “discounts” are available, then we are back to the Lexis and Westlaw model. Instead of discounts, why not just lower the per attorney rate by half or more…then it might be a threat. Benchmarking Legal Research Resources—Fact or Fiction? We are being asked a lot about our “Benchmarking Experience” as though it is the only ingredient in a Library Service cost reduction program. This is scary because knowing how much something should cost is important, but it is not the only guideline in negotiating/’rightsizing’ library contracts. You know, it’s really easy for anyone off the street to gather some data, divide it by the number of units and come up with an average. The real work comes and is helpful when the VALUE of something is determined. Library cost benchmarking is nonsense. What the firm down the street spends is irrelevant to your firm and the needs of your attorneys. Cost per unit and its value to your firm is what matters. Sometimes your online contract or book agreements shouldn’t just be reduced – they may need to be completely restructured! We see some firms pay MORE after some consultants leave simply due to the lack of a true NEEDS assessment of the practice that results in a contract structure that increases costs! A law firm’s information needs change over time. Has anyone talked to you about your legal research strategy and the resources you should have to support that strategy now? Next year? Did you know you can reform online contracts, save money and actually have your attorneys think they have more to work with? Finally, it’s complicated, and the vendors certainly aren’t going to simplify it for you. Your consultants should be assessing the individual needs of your firm, determining value and simplifying your contracts IN ADDITION TO reducing costs. Period. We not only help firms save money…we help them determine what they need and how much to pay for it. That’s the real bottom line. Lexis may look a bit different this morning. No…you didn’t forget to have your coffee, Lexis has significantly changed its UI. Although this seems to be a response to WestlawNext, it doesn’t appear that the search functionality has changed. Lexis remains a product where a database must be selected first, then searching can occur. 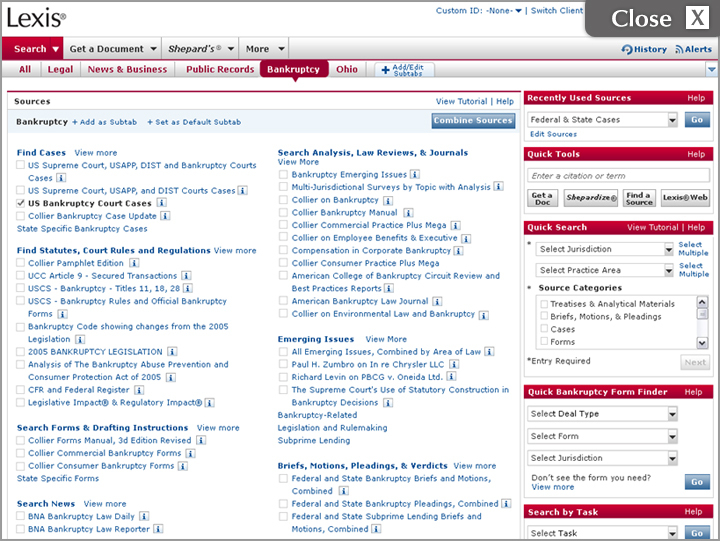 The only change to content is the addition of Lexis Web results. Not sure how the mix of free and paid resources will affect billing. Fifty-eight percent of legal professionals admit that the quality of their work suffers at times because they can’t sort through the information they need fast enough. On average, slightly over half (51%) of all legal professionals surveyed feel that people starting out in the legal industry are not well prepared for the amount of information management and processes they will have to manage in their jobs. On average, legal professionals report spending just over half (51%) of their work day receiving and managing information, rather than actually using information to do their jobs.